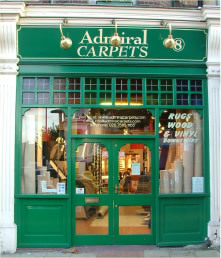 I use Admiral Carpets for all my projects and recommend them to clients, however big or small the job because I know they are competitive, friendly and will do a good job consistently. They always give sound advice and can source pretty much anything I ask them to, whether it be a flat in Mayfair or an office in Kensington. No complaints at all. In our showroom we have Stock carpets (40 – 60 samples) on a regular basis which can be taken away for colour matching in your own home. These carpets can be ranges that we buy in bulk and receive a discount on that we pass on to the public or discontinued ranges and sometimes we have very slight seconds. We stock a lot of high quality brands that will give your house or office the perfect finish. A free estimating service is available so we can get a precise estimate to you quickly and efficiently. All ranges show if the carpets are Moth proofed or Stain protected or both.